Once again we’ve got toppy markets that are not supported by fundamentals other than large scale central bank stimulus. Of course, that very large scale stimulus has been all that’s needed to keep most global indexes and other risk asset barometers rising in 2012 despite the persistent dour fundamentals of recession, EU solvency threats, etc, but how long can that be enough? On the one hand, the Fed’s QE 3 hasn’t yet shown much benefit for either asset prices or employment. On the other hand, the ECB’s OMT, as yet unused, continues to get the credit for falling GIIPS bond yields and thus a welcome respite from bearish EU crisis anxiety. However, it could well be different this time. Unlike in 2012, stimulus alone may not be enough. The S&P 500 and other global risk asset barometers are mere percentage points away from decade-old resistance that held in both 2000 and 2012, when the supporting fundamentals and sentiment appeared far more supportive of a break higher. So why should we expect a break higher now? Is stimulus alone enough? Rising Solvency Risk. Markets have clearly become complacent about all but the most pressing EU or US solvency risks, because they’ve come to expect that after the expected brinksmanship for the sake of gaining favor with voters, leaders predictably retreat and agree to borrow/lend/print more money and defer default and contagion risk to a later time. Therefore the only thing that would spark a selloff is something that suggests another round of borrowing with printed money isn’t happening, or at least won’t happen fast enough to avoid a default. See our full article on this very topic here, which covers the 7 reasons markets are overbought, how long this situation can continue, and what you can do for both protection and profit. Late last week US markets recovered after early losses on news that the Republicans would agree to a 3 month debt ceiling extension. Bullish headlines like this will probably be more influential given that markets are receptive to good news and blasé about deadlock, which are seen as just grandstanding for the voters. Investors appear to expect such drama until pressure of the final days forces some kind of deal. Thus at this stage the potential here is more bullish than bearish unless markets are already in selloff mode. The BOJ, which will hold its policy review on Jan. 21-22, to further increase buys of assets such as government bonds. Anticipation of a grand new stimulus program has been pushing up Japanese stocks and related assets for months, and driving the JPY and related assets lower. The big question then, is obviously whether the BoJ beats expectations enough to sustain these trends, or if the announcements falls short of expectations and sparks a “sell the rumor” reversal. Longer term there is no reason to suspect the JPY can’t fall further given Japan’s desire for a cheaper yen, possibly much cheaper, regardless of the longer term risks from mass money printing that include excessive inflation and rising JGB yields. While there may be a brief reversal, we believe then JPY’s longer term downtrend remains intact, though it may well be poised for a break. Discussions on the Cyprus bailout. The result hinges on general desire to grant it and avoid contagion risk versus German demands that Cyprus take real steps to stop its banks (the ones getting bailed out because they hold Cyprus bonds) from aiding Russian mafia money laundering and German tax evasion. Use of ESM funds for direct bank recapitalizations. This is important for Spain and Ireland as it would provide some relieve their taxpayers of the full bank bailout burden. The combination of long anticipated weakness and focus on anticipated Japan stimulus, US debt ceiling, and Chinese data have made even surprising earnings news irrelevant for moving markets. This will be the third week for earnings reports, which is typically the last one that matters for moving markets. After this week the tone and impression is set, and markets lose interest as most of the sector leaders have already reported. Wednesday: UK MPC meeting minutes – the UK is at risk of falling into a triple dip recession so markets will be eager to hear if the BOE has any policy changes coming. Friday: German Ifo business climate survey, UK prelim GDP – again, could change perceptions on whether the UK is falling back into recession, US new home sales. 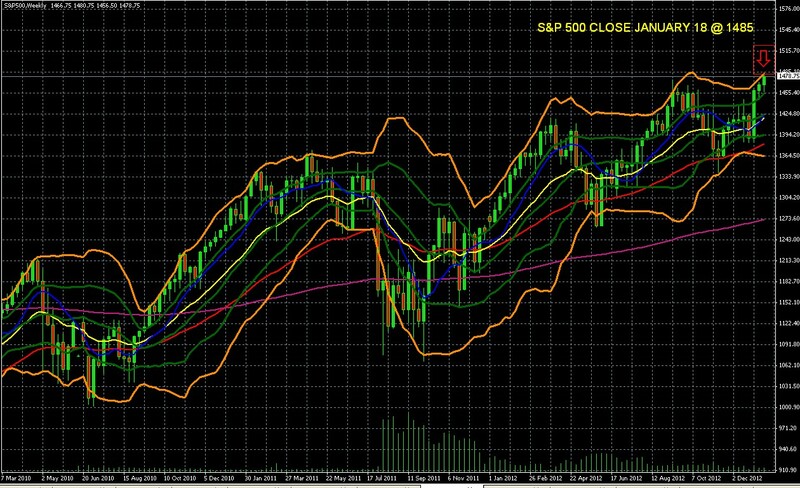 The index has closed for the third straight week in the upper quadrant of the double Bollinger bands. That’s the “buy zone” that tells us the upward momentum is likely to continue and thus it supports new long positions. See here for a brief explanation of how to interpret double Bollinger bands, which are arguably among the most useful single technical indicators there are. The only bearish aspect of the chart is that it is so close to the decade high of around 1550. Over the past year we’ve seen this situation before, and momentum, supported by stimulus, has won out. Will this time be different? Probably. Markets need a compelling reason to break through decade-old resistance that has been tested twice in both the summers of 2000 and 2007, when all looked rosy and there was no Great Recession, global recession, or EU crisis. Given the lack of supporting fundamentals, it’s hard to make a compelling case for why indexes and other risk asset barometers can expect to make a sustained move past that resistance when they couldn’t do so back in sunnier times. Believers in the power of stimulus may soon get their latest test.